Considering a new Bathtub for your South Pasadena home? Richard Libert Painting Inc. has provided high quality bathtub refinishing in South Pasadena Florida since 2002. If your bathtub is in need of a new look or repair, or you just want a change, Richard Libert Painting Inc. is South Pasadena's trusted bathtub refinisher. Looking to refinish your outdated bathtubs and give your South Pasadena home a new look? Call Richard Libert Painting Inc. and let us help you. 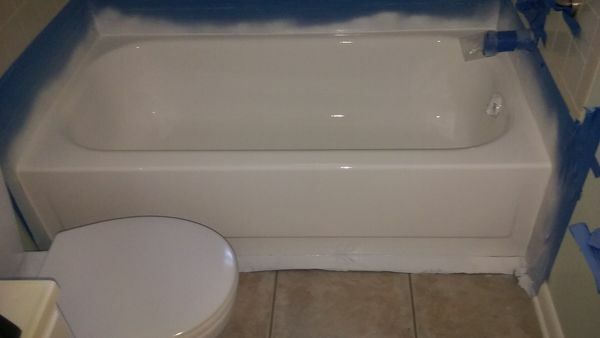 We can resurface your South Pasadena tub whether it’s made out of porcelain, fiberglass, acrylic, or cultured marble. Even if you’ve got a hot tub, Jacuzzi, or clawfoot-style bathtub, Richard Libert Painting Inc. can give it a whole new life at a huge savings in money and time over replacement. If you want a new look for your whole bathroom, Richard Libert Painting Inc. can refinish and reglaze your sinks in South Pasadena Florida. We can also refinish the sink in your kitchen or other area of your South Pasadena home. Richard Libert Painting Inc. also can also repair your South Pasadena bathtub, sink, shower, Jacuzzi, or hot tub. We can fill cracks or chips, repair tile grout, eliminate thermal cracks, even fix your fiberglass bathtub or shower or Jacuzzi. Give Richard Libert Painting Inc. a call at (813) 419-1600 to learn more about bathtub refinishing in South Pasadena Florida.